You are going to learn to Update Windows Defender in Windows 7, 8, 8.1 and 10. Windows Defender is the only security software available in Windows software series that provides firewall, Malware protection, Spyware protection, and Virus protection. And when it gets outdated, the chances of Spyware and Malware attacks increases. Therefore, to be always stay protected from most of the harmful viruses and Spywares, you need to check for Windows Defender updates in your Windows PC on a regular basis. And without wasting a second, you should download and install the Virus and Spyware definitions if new updates get available. Let’s start this article and let me first explain everything related to it so there will be no doubt left in your mind. 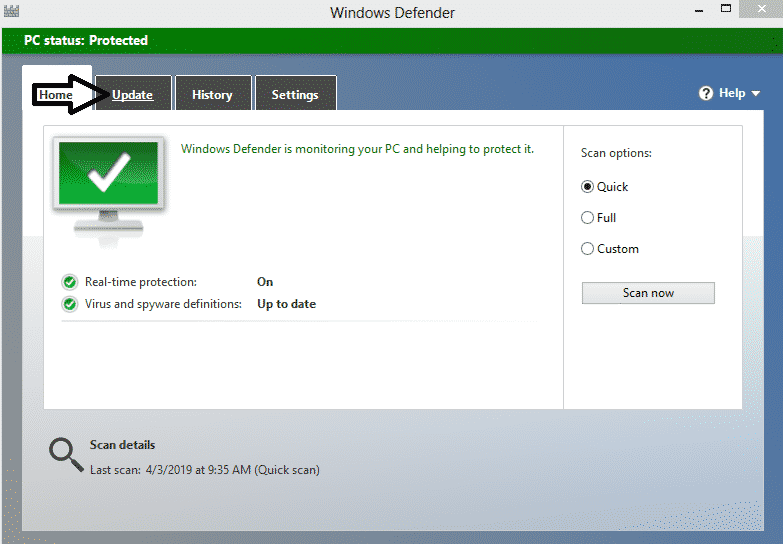 0.1 What is Windows Defender? 0.2 How Windows Defender finds the Malicious files in Windows PC? 0.3 Do you Need an Antivirus software if you have Windows Defender Active on your Windows PC? 1 How do I manually Update Windows Defender in Windows 7, 8, 8.1 and 10? 2 How do I get Windows Defender to Update Automatically? Windows Defender is all in one security software provided by Microsoft. It mostly comes pre-installed in Microsoft Windows software with the aim to provide security features to the users. Windows Defender is capable of fighting with Virus, Spyware and other types of malicious files. When the real-time protection is turned ON in Windows defender, it will automatically detect the malicious files from your computer HDD if it’s available there. You will get notified to take action against that detected malicious file. Most of the times, Windows defender automatically deletes that with the notification “malicious file has been blocked or deleted”. How Windows Defender finds the Malicious files in Windows PC? Windows Defender finds the malicious files in a Windows PC using the Spyware, Virus and other malware definitions. These definitions help the Windows defender to find the latest Viruses and Spywares in a Windows PC. Whenever you update Windows defender or it takes the update automatically, latest definitions get added to it. And then it uses these updated definitions to identify malware or potentially unwanted software in PC that running Windows software. And it doesn’t sleep, always stay active 24/7 until you turn off the Real-time protection from the Windows Defender settings. Do you Need an Antivirus software if you have Windows Defender Active on your Windows PC? No, you don’t need any extra Antivirus software if you have Windows Defender turned ON in your Windows PC. Unless you do very private work or store any type of informative details on your PC, you don’t need other antivirus helps. Windows Defender is well capable of handling medium to high-level malware and viruses. And you can rely on Windows Defender to protect your Windows PC without fear of getting attacked by any kind of virus. Now, let’s come to the main part of this article, its how you can update Windows defender and stay under cover from different types of malicious files. How do I manually Update Windows Defender in Windows 7, 8, 8.1 and 10? First, open the control panel from the desktop or search for control panel through search bar and open it. Change View by to Large icons from the top right corner. 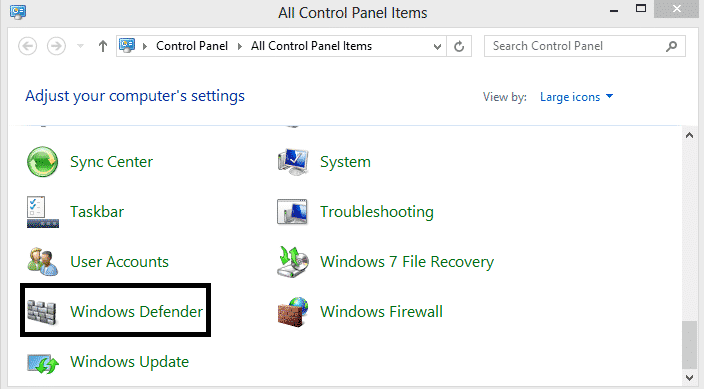 Doing this will help you find the Windows defender under control panel more easily. Once you change the view to Large icons, you will able to see the Windows Defender gateway to the last row of the window. Click on Windows defender to open it up. 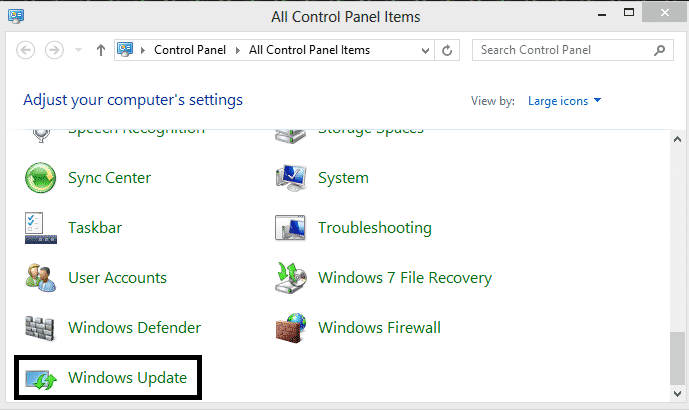 Now, Windows Defender is opened, click on the Update tab from top to be able to update it. Under the Update tab, click on the Update button to check for the latest definitions of Spyware, Virus, etc. If any new Definitions will be available, it will get downloaded and installed. That’s how you can manually update Windows Defender in Windows 10 and other Windows version. How do I get Windows Defender to Update Automatically? From the old Windows Defender to latest Windows Defender version, you will not find any option to enable the automatic update. Even in all the Windows Defender that available in different Windows, virus and Spyware definitions updates get downloaded and installed automatically. You don’t always need to update the Windows Defender manually. Sometimes, you may see a warning or notification in the Action center to update the Virus and Spyware definition. When you see this then it means a new Virus and Spyware definitions are available for Windows Defender. And through clicking on that important notification, you can easily install the updates. The best way to set Windows Defender to Update automatically is to enable the automatic Windows update. Open the Control panel or search Control panel in the Search bar to find and open it. Make sure View by is set to Large icons at the right top corner. Then tap on Windows update from the last row of the window. From the left sidebar, click on Change settings. 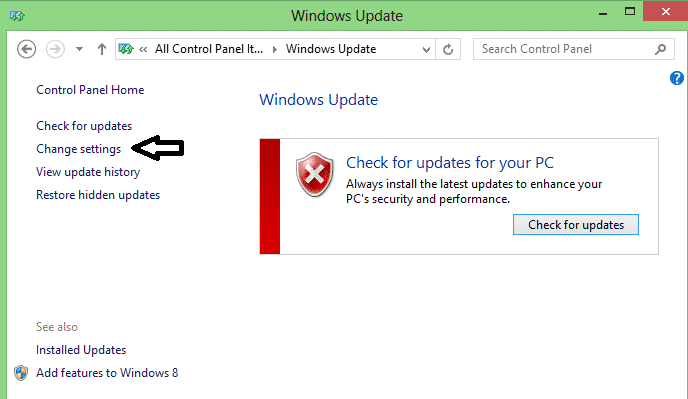 In the next window, under Important update, set Install updates automatically (recommended). Press OK from the right bottom to save changes. Now, whenever a new definition in Windows Defender gets available, it will get downloaded and installed automatically. 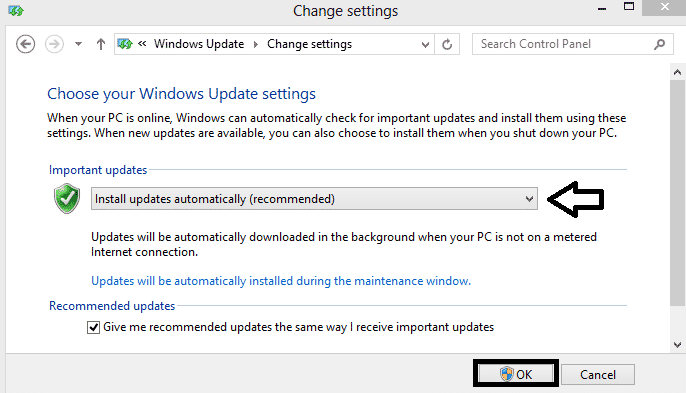 It may leave a notification of the update for you if your computer is running Windows 10 or 8.1. So, that’s how you can set Windows Defender to install updates automatically. You just need to enable the Windows update to install automatically and it applies for Windows Defender too. Updating Windows Defender is very necessary and you don’t need to take it for granted. Because who knows when you get attacked by a malware that corrupts every document file available in your Windows PC. In most of the Windows defender version, virus and spyware updates get installed automatically. And sometimes you need to click on the important notification from Action center to allow Windows defender to get updated with latest virus definitions. If still, you are facing problem in updating your Windows defender in your Windows PC, then comment below. I will like to solve it with the expectation to hear thanks from your side. For me, it will be the greatest pleasure if I will be able to solve your problem related to updating Windows Defender. Hopefully, you’ve got learned to update Windows defender? If so, I want you to share this article with your friends to need this type of guidance. In the end, thanks for reading at rogtechs.com, I will come up with a similar article in the future so make sure you follow us our social page to stay updated.